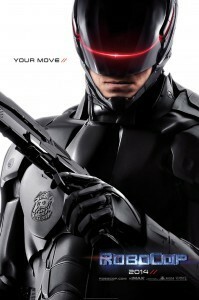 Your friendly neighborhood cyborg cop, RoboCop, is back. You may have already seen the new movie remake of the 1987 classic. Thinking back on the original movie, as a kid, I felt it offered a depressing version of the future, scary tech in the hands of bad people. Now as an adult, it makes me further wonder. Are we ready to handle the technology offered up in the movie? We better be, because now 27 years later, it's nearly here. I got the chance to talk to filmmaker and futurist Jason Silva about these topics. He suggests that not only should we not be afraid of our bold new world, but we may all already be cyborgs. Alejandro Rojas: Have you been able to screen the movie yet? Jason Silva: I have not, but the whole idea of the man-machine symbiosis is something I talk a lot about in my work. I make short films, little documentaries, about the co-evolution of humans and technology. I basically look at how exponential emerging technological changes runs counter-intuitive to the way our linear brains make projections about change and so we don't realize how fast the future is coming. It is something I explore a lot in my work. I think the things that this film looks at are not farfetched at all. We are going to see this sort of symbiotic relationship deepen in the very near future. Rojas: How much have robotics moved into prosthetics? Silva: I think we are seeing a crazy amount of it. I remember recently I was at a Singularity University event in the Fox lot in California, and they had these people that had spinal cord injuries and they were paralyzed. They had these robotic exoskeletons that allowed them to walk for the first time since their accidents. Literally, these exoskeletons were allowing paralyzed people to walk. I think we are going to see a lot more of that. I think people who have all kinds of debilitating mobility issues will benefit from robotic augmentation. That is even before we get into organ replacement and organ printing and synthetic biology and so on and so forth. Rojas: How long do you think it will be before it will not be unusual for a guy to have robotic legs? Silva: Well, it already exists. We already have these people that have these prosthetic leg replacements that are getting better and better all the time. There was a guy, I think he is at Oxford, a roboticist, who connected a robotic hand to his nervous system, and he was in a different laboratory. With his mind he was able to open and close the robotic fist that he was linked to. It was insane. Rojas: What are some of the ways you think humans will first venture into augmenting themselves to improve their capabilities? Silva: Well, we have always been doing it, right? There is this whole idea that we are already cyborgs. There is a book by Andy Clark -- he is a cognitive philosopher -- called Natural-Born Cyborgs. He says we have always extended our capacities with our tools and we should think of these tools as an extension of our cognition, and that technology [is] our exoskeleton. It is our second skin. It is our extended phenotype. So it is innate in our species to be cyborgian in nature. Silva: Oh, I definitely think that. Right now, [a computer] used to be half a building and now it is in our pocket, inside the fabric of our clothing. The phone is gonna disappear. Maybe it will be a bracelet. After the bracelet it will be a blood cell-sized device that maybe gets installed. We already have people with Parkinson's that have chips installed in their brain to control their tremors. Rojas: What are some of the concepts in the movie that get you excited? Silva: All of them. The idea of human augmentation. The idea of using our genius to extend our genius. We have all kinds of limitations as human beings. I mean we can't see the whole electromagnetic spectrum, we can't see the very small, we can't see the very far. So we compensate for these short comings with technological scaffoldings. The microscope allows us to extend our vision into the micro-sphere. The telescope allows us to extend our vision into the macro-sphere, the Hubble Space Telescope extends our optic nerve into space, and it allows us to mainline space and time through our optic nerve. And so I think in the contexts of this movie it has taken that metaphor and says look at the way we extend our capacities. How do human beings compensate for their limitations by using technologies to overcome those limitations? The whole movie plays on that theme. Rojas: When thinking of the movie in the 80s, it was this neat idea for the future, but now talking to you it seems more immediate. It is here. It is time for us to start thinking about this now. Silva: Oh yeah, absolutely. To start thinking about it, but not to be doom and gloom about it. Not to be frightened. Not to ring the alarm bell. This doesn't mean the end of humanity. This means the beginning of the next chapter. I guess that is the message I want to put out there. To read this interview in its entirety visit AlejandroTRojas.com.